Buy the Vernazza Two Piece Bikini sewing pattern from The Friday Pattern Company. Whether you’re frolicking along the coastline of northern Italy or sunbathing in your backyard, the Vernazza Two Piece will have you feeling glamorous and comfortable. It features tank straps, an adjustable tie front, and a soft waistband. The bottoms hit at about your belly button and can easily be adjusted for a higher or lower rise. This is a simple swimsuit with a lot of style. It is fun to sew and is perfect for the very confident beginner or intermediate sewist. 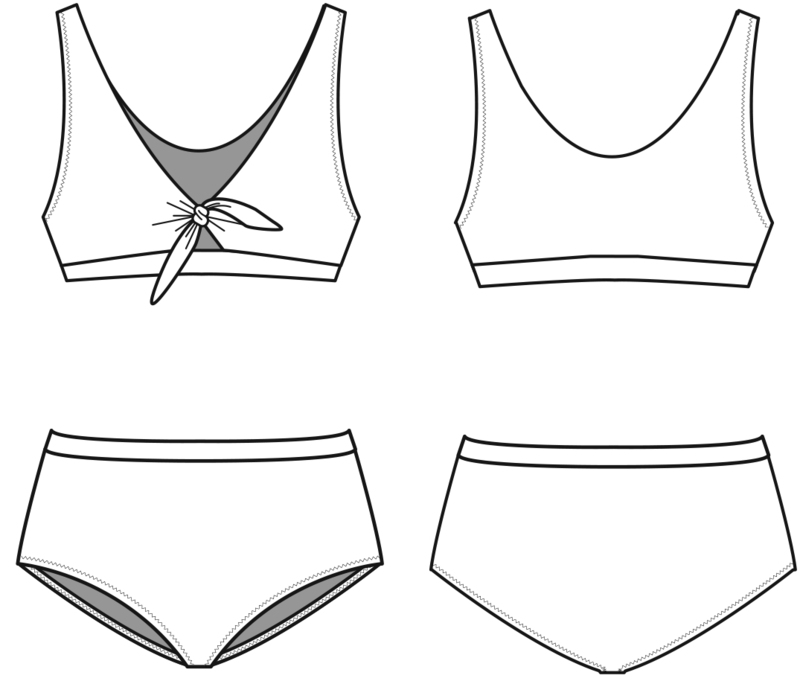 Suggested fabrics: This pattern is designed for swimsuit knits with a high amount of stretch (50-60%). Fabric with lycra or spandex will hold up the best. If you’re using the suit for swimming, you’re going to want to avoid fibers that hold a lot of water (cotton). You can line your bottoms with swimsuit lining or the same fabric you are using for the rest of your suit. If you are not using swimsuit lining, add a half yard to the yardage requirements listed below. Main fabric: XS-M // 45” wide fabric // 1.3 yards (1.2 metres), L-XXL // 45” wide fabric // 1.5 yards (1.4 metres) XS-M // 54-60” wide fabric // 1 yard (.9 metres), L-XXL // 54-60” wide fabric // 1.13 yards (1 meter). Lining: all sizes // 45-60” wide // .5 yards (.55 metres). Sizing: This pattern is available in approx. UK size 8-18. Please check the sizing chart and finished garment measurements. Notions: 4 yards ¼” wide elastic, Stretch sewing machine needle, Optional: 1-2 yard ¾” wide elastic (if you want to add elastic to the waistbands on the top and bottom), Soft foam cups (if you want a little more coverage), power mesh to go between layers of fabric for added support (you’ll need about a yard if you’re lining the whole suit). This sewing pattern is available in PAPER and PDF format. PDF version of the pattern will be available immediately for download after purchase. PDF pattern includes: Print at home pattern (12 pages), Instructions packet and Print Shop PDF (24″x36). This was the first swimsuit I ever made and hence was super nervous about how this would turn out. Luckily for me the instructions are super comprehensive and the video on elastic insertion made the whole process a lot less scary than I thought it would be.